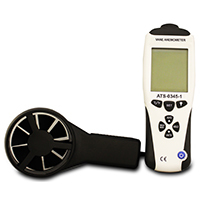 The ATS-0345-1 is a portable vane anemometer for measuring air flow speed and volumetric flow rate. The rotating blades create a frequency proportional to the wind speed. This frequency is accurately converted to speed with 0.1 m/s accuracy. The compact and ergonomic design allows the ATS-0345-1 to be portable, the anemometer’s hard plastic carrying case makes transport and storage easy.